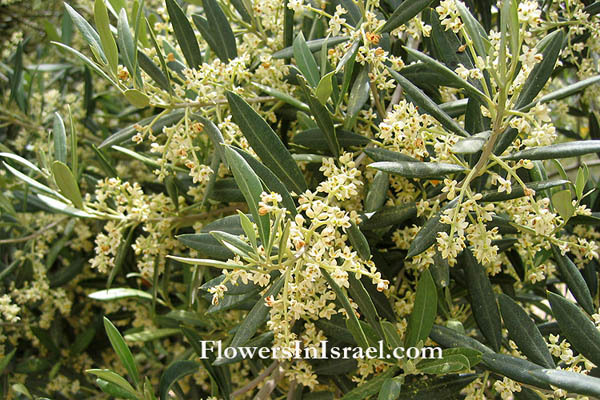 Scientific name: Olea europaea L.
The olive is one of the Biblical Seven Species, with which Eretz Yisrael is blessed: "a land of wheat and barley, of vines, figs and pomegranates, and land of olive trees and honey" (Deuteronomy, 8.8). For thousands of years the olive branch has been used as a sign of peace and goodwill; it is hence the attribute of Peace personified. The symbolism is deriving from the Biblical story (Genesis 8:10-11); the sprig of olive brought back to the ark of Noah by the dove. In Greek Mythology the olive tree was sacred to Athene who caused an olive tree to sprout during her contest with Poseidon. It is her attribute and that of Wisdom whom Athene personifies. Greek mythology describes the olive tree as a gift from the gods, it represented power and peace: power, because of its longevity and its ability to flourish on the most barren terrain and peace, possibly because of its solitary tranquility. This was the reason that the winners of the ancient Olympic Games, who represented the same ideals of strength and peace, were awarded the "kotynos", a wreath made from a branch of wild olive. The olive wreath or crown was the highest award given to a citizen in ancient Greece. Homer in the Odyssey called the olive "liquid gold". Olive oil played a part in almost every aspect of daily life in ancient Israel and this importance is reflected in several verses. Disobedience to God would result in a loss of the olive crop (Deuteronomy 28:40). The oil honored both God and men (Judges 9:9) and was a component of the anointing oil of the high priest (Exodus 30:24). The act of anointing with oil is called "meshikha". The Hebrew word for anoint is messiah. The Greek word ХРІΣΤΨΣ or christos was the practice of "dubbing oil" on athletes following competition, hence the words Messiah or Christ. Large supplies of oil were a sign of prosperity. The excess oil can be stored for up to six years; such stores were of national concern. For example, in the days of King David, Joash was in charge of the supplies of olive oil (I Chronicles 27:28). Olive Oil was so fundamental to all facets of Jewish life that those who produced it had to be ritually pure. It served as a major source of dietary fat, as lightning, as a base for cosmetics, perfumes and ointments. It was rubbed on the body to mix with oils and dirt present on the skin. It was then scraped off with a strigil, a sickle-like instrument, with a curved blade. The olive (zaytun) is mentioned four times in the Quran, twice together with the pomegranate (rumman, Q 6:99; 6:141), twice together with the date palm (Q 16:11; 80:29) and once with the fig (Q 95:1). The remarkable root system of the olive tree is the secret of its survival in its dry, rocky, habitat. To produce a good crop, however, the trees need a great deal of attention throughout the year--careful pruning, cultivating, and fertilizing. One of the characteristics of the olive tree is the production of sprouts at its base. In Bible times olives were often grown directly from the sprouts. The olive farmer would select sprouts from his best trees, remove them, and plant them where they would be carefully tended. Psalm 128:3 may be a reference to this practice- "your children will be like olive plants round your table." In begin of May the olive begins to flower and in autumn, they begin to produce their fruit. The olives are harvested at the precise moment when they are most suitable for pressing. They are harvested as in Bible times by carefully beating the trees with sticks and then picking up the olives from the ground. 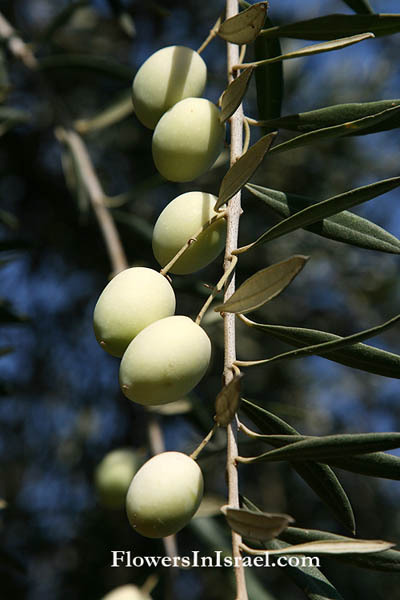 The olives went through three pressings: the first stage produced the best oil, a second and third pressing continued the process, which was completed over a twenty-four hour period. An olive press includes an installation for crushing olives and an oil press system operated by means of a beam or a screw. The first stage of ancient production of olive oil was crushing the olives on a circular mill. They were spread on a horizontal stone basin and a vertical grindstone was rolled over the olives to crush them. This was the best-quality or virgin oil. The second stage was pressing the crushed olives with a beam- or a screw-press. Pulp from the initial crushing was placed in woven baskets, that were loaded onto a press, that worked with a heavy horizontal beam let into a notch in the wall acting as a lever to press out the oil and water from the mash seep out of the mats, by adding stone weights progressively increasing the pressure and drip into collection vats. Another method is the screw-press. When the screw had been tightened to the point that the uprights began to lift, their weight constituted the pressure. The third stage was the separation of the oil from the watery lees in the expressed liquid. The oil was removed from the vats by a dipper. The olive oils are classified. The difference between oils is in their acidity and the order of pressing. The free acidity [expressed as oleic acid] of Extra Virgin Olive Oil [first pressing] must not exceed 1% or 1 gram per 100 grams. The free acidity or oleic acid of Virgin Oil [second pressing] must not exceed 2% or 2 grams per 100 grams. Semi Fine Virgin Olive Oil: is an olive oil that has an oleic acid content between 2 and 3.3%. Refined Olive Oil: is initially an olive oil with poor aroma and color and contains more than 3.3% oleic acid. After a refinement process loses it's oleic acid as well as its aroma and color, but becomes edible. Pure Olive Oil: is a mixture of refined olive oil and virgin olive oil with an oleic acid content of no more than 1.5%. but during the seventh year let the land lie unplowed and unused. Then the poor among your people may get food from it, and the wild animals may eat what is left. Do the same with your vineyard and your olive grove. And from the finest wheat flour make round loaves without yeast, thick loaves without yeast and with olive oil mixed in, and thin loaves without yeast and brushed with olive oil. From the basket of bread made without yeast, which is before the LORD, take one round loaf, one thick loaf with olive oil mixed in, and one thin loaf. With the first lamb offer a tenth of an ephah of the finest flour mixed with a quarter of a hin of oil from pressed olives, and a quarter of a hin of wine as a drink offering. 500 shekels of cassia—all according to the sanctuary shekel—and a hin of olive oil. They also brought spices and olive oil for the light and for the anointing oil and for the fragrant incense. “‘If you bring a grain offering baked in an oven, it is to consist of the finest flour: either thick loaves made without yeast and with olive oil mixed in or thin loaves made without yeast and brushed with olive oil. If your grain offering is cooked in a pan, it is to be made of the finest flour and some olive oil. “‘If, however, they cannot afford two doves or two young pigeons, they are to bring as an offering for their sin a tenth of an ephah of the finest flour for a sin offering. They must not put olive oil or incense on it, because it is a sin offering. The priest is to take a handful of the finest flour and some olive oil, together with all the incense on the grain offering, and burn the memorial portion on the altar as an aroma pleasing to the LORD. and every grain offering, whether mixed with olive oil or dry, belongs equally to all the sons of Aaron. “‘If they offer it as an expression of thankfulness, then along with this thank offering they are to offer thick loaves made without yeast and with olive oil mixed in, thin loaves made without yeast and brushed with oil, and thick loaves of the finest flour well-kneaded and with oil mixed in. And from the basket of bread made without yeast, which was before the LORD, he took one thick loaf, one thick loaf with olive oil mixed in, and one thin loaf, and he put these on the fat portions and on the right thigh. “On the eighth day they must bring two male lambs and one ewe lamb a year old, each without defect, along with three-tenths of an ephah of the finest flour mixed with olive oil for a grain offering, and one log of oil. together with its grain offering of two-tenths of an ephah of the finest flour mixed with olive oil—a food offering presented to the LORD, a pleasing aroma—and its drink offering of a quarter of a hin of wine. “Command the Israelites to bring you clear oil of pressed olives for the light so that the lamps may be kept burning continually. “They are to take a blue cloth and cover the lampstand that is for light, together with its lamps, its wick trimmers and trays, and all its jars for the olive oil used to supply it. then he is to take his wife to the priest. He must also take an offering of a tenth of an ephah of barley flour on her behalf. He must not pour olive oil on it or put incense on it, because it is a grain offering for jealousy, a reminder-offering to draw attention to wrongdoing. together with their grain offerings and drink offerings, and a basket of bread made with the finest flour and without yeast—thick loaves with olive oil mixed in, and thin loaves brushed with olive oil. Have them take a young bull with its grain offering of the finest flour mixed with olive oil; then you are to take a second young bull for a sin offering. The people went around gathering it, and then ground it in a hand mill or crushed it in a mortar. They cooked it in a pot or made it into loaves. And it tasted like something made with olive oil. then the person who brings an offering shall present to the LORD a grain offering of a tenth of an ephah of the finest flour mixed with a quarter of a hin of olive oil. “I give you all the finest olive oil and all the finest new wine and grain they give the LORD as the firstfruits of their harvest. together with a grain offering of a tenth of an ephah of the finest flour mixed with a quarter of a hin of oil from pressed olives. [ Sabbath Offerings ] “‘On the Sabbath day, make an offering of two lambs a year old without defect, together with its drink offering and a grain offering of two-tenths of an ephah of the finest flour mixed with olive oil. He will love you and bless you and increase your numbers. He will bless the fruit of your womb, the crops of your land—your grain, new wine and olive oil—the calves of your herds and the lambs of your flocks in the land he swore to your ancestors to give you. then I will send rain on your land in its season, both autumn and spring rains, so that you may gather in your grain, new wine and olive oil. You must not eat in your own towns the tithe of your grain and new wine and olive oil, or the firstborn of your herds and flocks, or whatever you have vowed to give, or your freewill offerings or special gifts. Eat the tithe of your grain, new wine and olive oil, and the firstborn of your herds and flocks in the presence of the LORD your God at the place he will choose as a dwelling for his Name, so that you may learn to revere the LORD your God always. When you beat the olives from your trees, do not go over the branches a second time. Leave what remains for the foreigner, the fatherless and the widow. They will devour the young of your livestock and the crops of your land until you are destroyed. They will leave you no grain, new wine or olive oil, nor any calves of your herds or lambs of your flocks until you are ruined. lit the torches and let the foxes loose in the standing grain of the Philistines. He burned up the shocks and standing grain, together with the vineyards and olive groves. Then Samuel took a flask of olive oil and poured it on Saul’s head and kissed him, saying, “Has not the LORD anointed you ruler over his inheritance? But David continued up the Mount of Olives, weeping as he went; his head was covered and he was barefoot. All the people with him covered their heads too and were weeping as they went up. and Solomon gave Hiram twenty thousand cors of wheat as food for his household, in addition to twenty thousand baths of pressed olive oil. Solomon continued to do this for Hiram year after year. For the inner sanctuary he made a pair of cherubim out of olive wood, each ten cubits high. For the entrance to the inner sanctuary he made doors out of olive wood that were one fifth of the width of the sanctuary. And on the two olive-wood doors he carved cherubim, palm trees and open flowers, and overlaid the cherubim and palm trees with hammered gold. In the same way, for the entrance to the main hall he made doorframes out of olive wood that were one fourth of the width of the hall. But Elisha said to him, “Was not my spirit with you when the man got down from his chariot to meet you? Is this the time to take money or to accept clothes—or olive groves and vineyards, or flocks and herds, or male and female slaves? [ Jehu Anointed King of Israel ] The prophet Elisha summoned a man from the company of the prophets and said to him, “Tuck your cloak into your belt, take this flask of olive oil with you and go to Ramoth Gilead. Hezekiah received the envoys and showed them all that was in his storehouses—the silver, the gold, the spices and the fine olive oil—his armory and everything found among his treasures. There was nothing in his palace or in all his kingdom that Hezekiah did not show them. Others were assigned to take care of the furnishings and all the other articles of the sanctuary, as well as the special flour and wine, and the olive oil, incense and spices. Also, their neighbors from as far away as Issachar, Zebulun and Naphtali came bringing food on donkeys, camels, mules and oxen. There were plentiful supplies of flour, fig cakes, raisin cakes, wine, olive oil, cattle and sheep, for there was joy in Israel. Baal-Hanan the Gederite was in charge of the olive and sycamore-fig trees in the western foothills. Joash was in charge of the supplies of olive oil. He strengthened their defenses and put commanders in them, with supplies of food, olive oil and wine. As soon as the order went out, the Israelites generously gave the firstfruits of their grain, new wine, olive oil and honey and all that the fields produced. They brought a great amount, a tithe of everything. He also made buildings to store the harvest of grain, new wine and olive oil; and he made stalls for various kinds of cattle, and pens for the flocks. [ Rebuilding the Temple ] Then they gave money to the masons and carpenters, and gave food and drink and olive oil to the people of Sidon and Tyre, so that they would bring cedar logs by sea from Lebanon to Joppa, as authorized by Cyrus king of Persia. up to a hundred talents of silver, a hundred cors of wheat, a hundred baths of wine, a hundred baths of olive oil, and salt without limit. and that they should proclaim this word and spread it throughout their towns and in Jerusalem: “Go out into the hill country and bring back branches from olive and wild olive trees, and from myrtles, palms and shade trees, to make temporary shelters”—as it is written. They captured fortified cities and fertile land; they took possession of houses filled with all kinds of good things, wells already dug, vineyards, olive groves and fruit trees in abundance. They ate to the full and were well-nourished; they reveled in your great goodness. “Moreover, we will bring to the storerooms of the house of our God, to the priests, the first of our ground meal, of our grain offerings, of the fruit of all our trees and of our new wine and olive oil. And we will bring a tithe of our crops to the Levites, for it is the Levites who collect the tithes in all the towns where we work. All Judah brought the tithes of grain, new wine and olive oil into the storerooms. He will be like a vine stripped of its unripe grapes, like an olive tree shedding its blossoms. They crush olives among the terraces ; they tread the winepresses, yet suffer thirst. when my path was drenched with cream and the rock poured out for me streams of olive oil. Your wife will be like a fruitful vine within your house; your children will be like olive shoots around your table. Whoever loves pleasure will become poor; whoever loves wine and olive oil will never be rich. The wise store up choice food and olive oil, but fools gulp theirs down. From the sole of your foot to the top of your head there is no soundness— only wounds and welts and open sores, not cleansed or bandaged or soothed with olive oil. Yet some gleanings will remain, as when an olive tree is beaten, leaving two or three olives on the topmost branches, four or five on the fruitful boughs,” declares the LORD, the God of Israel. So will it be on the earth and among the nations, as when an olive tree is beaten, or as when gleanings are left after the grape harvest. Hezekiah received the envoys gladly and showed them what was in his storehouses—the silver, the gold, the spices, the fine olive oil—his entire armory and everything found among his treasures. There was nothing in his palace or in all his kingdom that Hezekiah did not show them. You went to Molek with olive oil and increased your perfumes. You sent your ambassadors far away; you descended to the very realm of the dead! The LORD called you a thriving olive tree with fruit beautiful in form. But with the roar of a mighty storm he will set it on fire, and its branches will be broken. They will come and shout for joy on the heights of Zion; they will rejoice in the bounty of the LORD— the grain, the new wine and the olive oil, the young of the flocks and herds. They will be like a well-watered garden, and they will sorrow no more. But ten of them said to Ishmael, “Don’t kill us! We have wheat and barley, olive oil and honey, hidden in a field.” So he let them alone and did not kill them with the others. So you were adorned with gold and silver; your clothes were of fine linen and costly fabric and embroidered cloth. Your food was honey, olive oil and the finest flour. You became very beautiful and rose to be a queen. Also the food I provided for you—the flour, olive oil and honey I gave you to eat—you offered as fragrant incense before them. That is what happened, declares the Sovereign LORD. You sat on an elegant couch, with a table spread before it on which you had placed the incense and olive oil that belonged to me. “‘Judah and Israel traded with you; they exchanged wheat from Minnith and confections, honey, olive oil and balm for your wares. The prescribed portion of olive oil, measured by the bath, is a tenth of a bath from each cor (which consists of ten baths or one homer, for ten baths are equivalent to a homer). He is to provide as a grain offering an ephah for each bull and an ephah for each ram, along with a hin of olive oil for each ephah. The grain offering given with the ram is to be an ephah, and the grain offering with the lambs is to be as much as he pleases, along with a hin of olive oil for each ephah. and the earth will respond to the grain, the new wine and the olive oil, and they will respond to Jezreel. Ephraim feeds on the wind; he pursues the east wind all day and multiplies lies and violence. He makes a treaty with Assyria and sends olive oil to Egypt. his young shoots will grow. 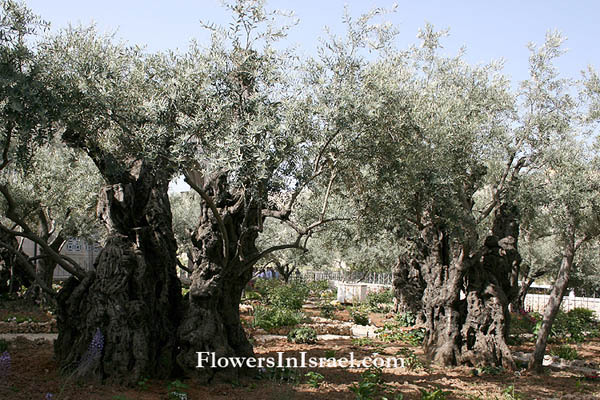 His splendor will be like an olive tree, his fragrance like a cedar of Lebanon. The fields are ruined, the ground is dried up; the grain is destroyed, the new wine is dried up, the olive oil fails. The LORD replied to them: “I am sending you grain, new wine and olive oil, enough to satisfy you fully; never again will I make you an object of scorn to the nations. “Many times I struck your gardens and vineyards, destroying them with blight and mildew. Locusts devoured your fig and olive trees, yet you have not returned to me,” declares the LORD. Will the LORD be pleased with thousands of rams, with ten thousand rivers of olive oil? Shall I offer my firstborn for my transgression, the fruit of my body for the sin of my soul? You will plant but not harvest; you will press olives but not use the oil, you will crush grapes but not drink the wine. [ The Gold Lampstand and the Two Olive Trees ] Then the angel who talked with me returned and woke me up, like someone awakened from sleep.